A friend told me his favourite experience from his French trip was drinking coffee out of a bowl in a café, as the locals do. Funny how a simple pleasure can trump the myriad offerings of a country renowned as a cultural juggernaut. I understand after visiting a Japanese teahouse. 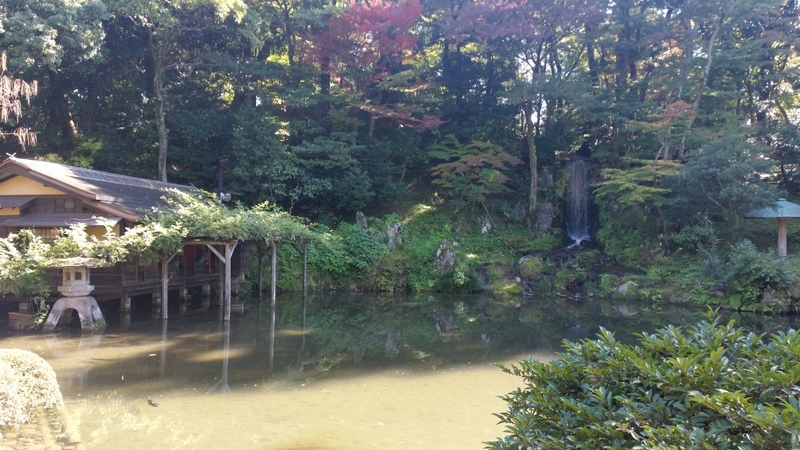 Kenrokuen Garden is Kanazawa city’s top tourist attraction and one of Japan’s top three gardens. It was an Edo period feudal lord’s private strolling grounds over 300 years ago; today, bobbing tour guide flags punctuate its lush expanse. But it has corners to escape to within its intricate design and surprising delights along its paths. 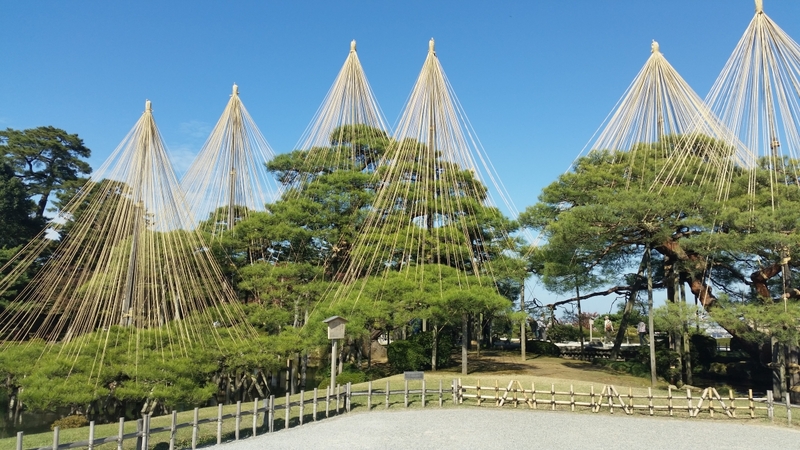 Yukizuri ropes support pine tree branches. They prevent damage from heavy snow. 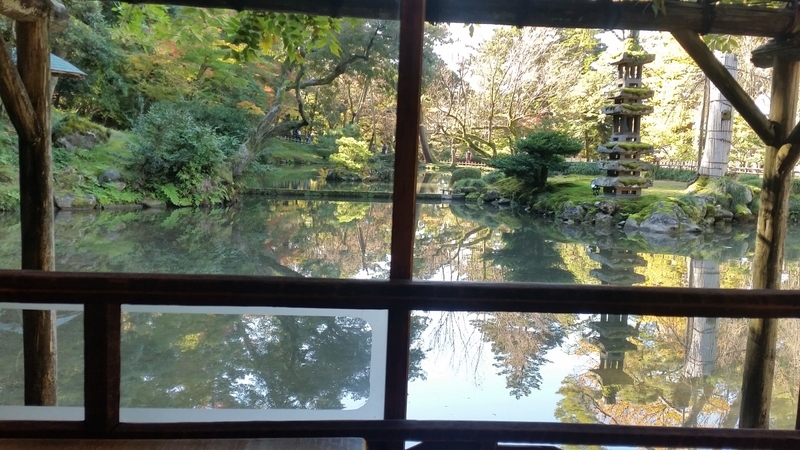 When we spied a tucked-away teahouse jutting over Hisagoike Pond, my two friends and I fell hard for this perfect embodiment of nature and peace. 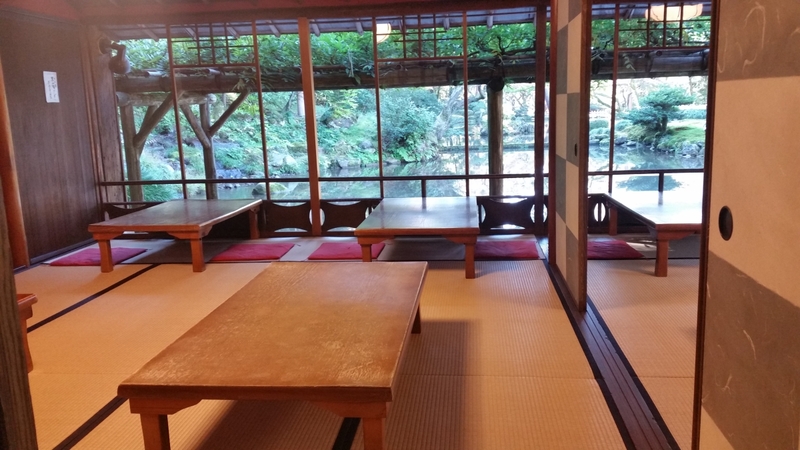 We slipped off our shoes and stepped over cool straw tatami mats to a table by the open window. 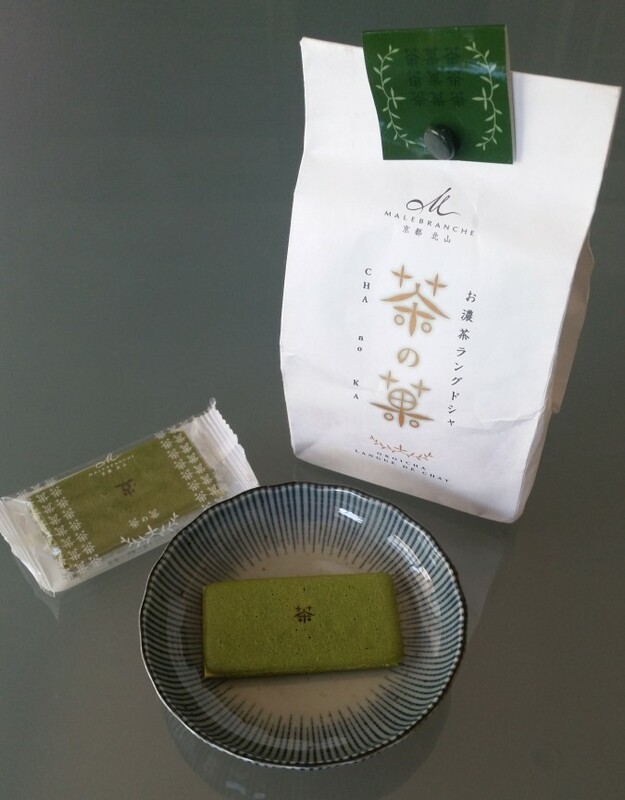 Entranced under a spell, we drank matcha powdered green tea and nibbled wagashi sweets. Our hostess padded in and out as softly as a cat. Plump carp wiggled and surfaced to pucker their fat lips at us. The only sound was the tinkling melody of a small waterfall. 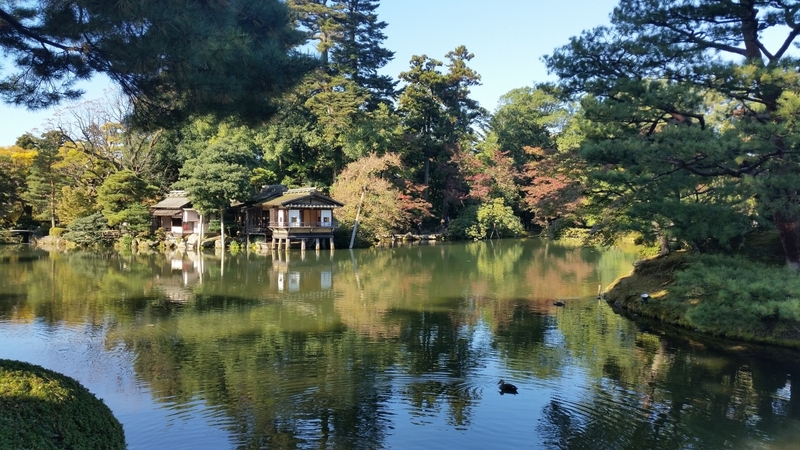 We’d spent five days ricocheting around Tokyo. It’s a giant, crazy, neon pinball machine. Bars, food, shops, trains – delirious fun. But this soothing pause had a potent, quiet power; like the moment the pinball spring launcher pulls back, before propulsion back into madness. The teahouse on the left. Waterfall on the right. Tea came to Japan from China around the 9th century. The first teas in Japan were black, similar to oolong, though green dominates today. It was expensive and consumed by the elite. Elaborate, guarded processions delivered it to shoguns and the Imperial Palace. During the 13th century, Zen Buddhist monks revered the use of tea for their long meditation sessions. There’s a legend that Bodhidharma, Zen Buddhism’s founder, cut off his eyelids to stay awake during years of uninterrupted meditation. His almond-shaped lids fell to ground and created the tea-plant. 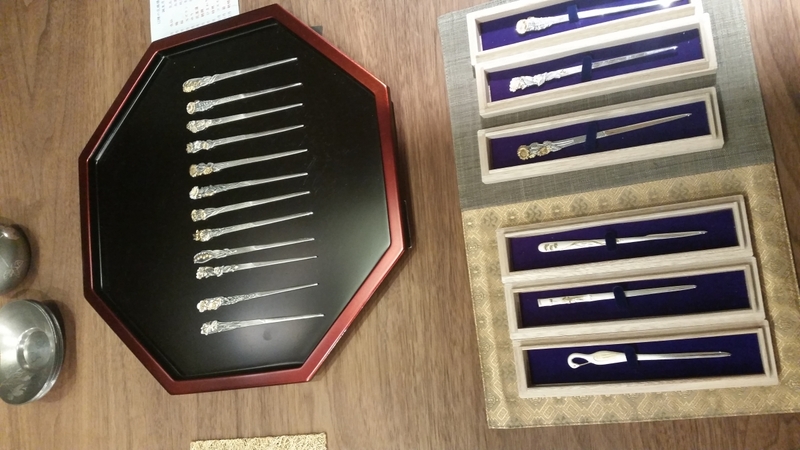 Rarefied tea ceremonies evolved during the artistic Edo period (1603-1868). However Zen simplicity still influenced the plainly decorated tea rooms. Minimal conversation while imbibing was encouraged. Compared to coffee, tea has a slighter caffeine kick. Coffee is jet fuel for the day ahead, lubricant for lively chat, often served in busy places. Tea leans towards reflection, detachment and privacy. Even in the West, it suits silence and the home. Today, the Japanese embrace both traditional and modern aspects of tea. Electric fans inhibit frost and machines harvest and process crops but premium sencha tea can still be handpicked, then hand rolled for five hours. An abacus is used in negotiations between farmer, broker and merchant at tea auctions. All parties clap their hands three times when a deal is sealed. 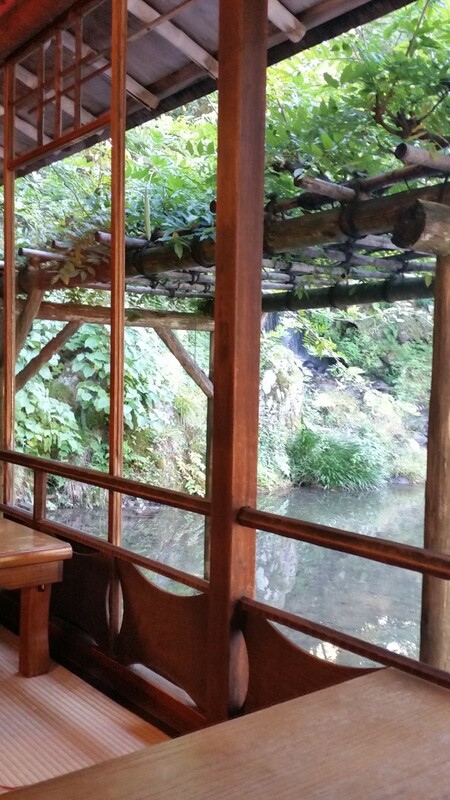 We relaxed in the teahouse without the ritual and pomp of a ceremony. No passing the same cup to your neighbour. (Don’t forget to wipe it first!) No need to comment on the exquisiteness of the ceramics. (Um, what to say?) 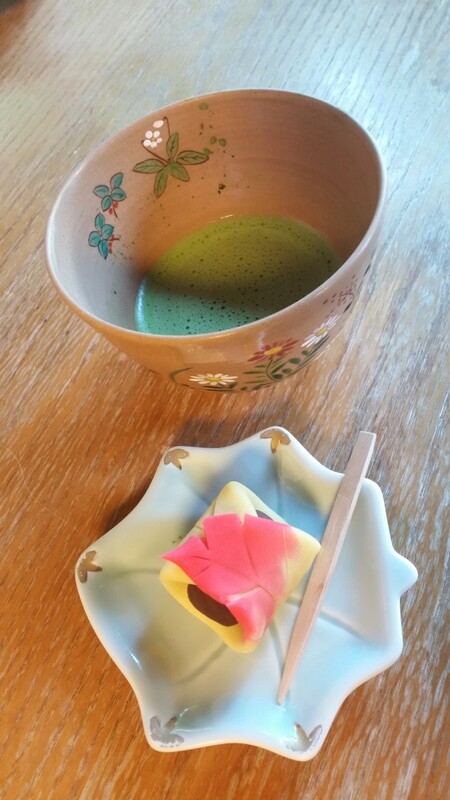 The sugary wagashi, shaped into an autumn leaf to honour the current season, was balanced by the bitter, frothy matcha. Originally simple fruits and snacks, wagashi was elevated during the Edo period into poetic, edible art. 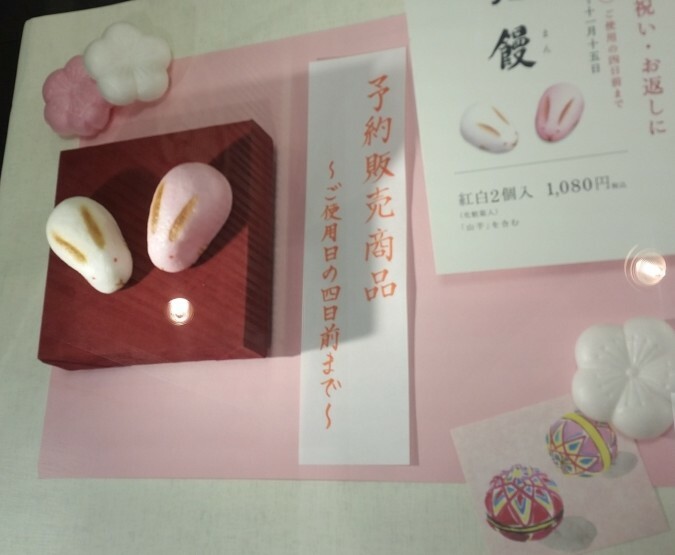 Wagashi celebrates natural scenery, flora, fauna or special events. For example, the moon on a lake, plum flowers, rabbits or a samurai helmut for a festival. Staple ingredients include adzuki beans, rice flour and sticky rice but there are endless variations representing the seasons such as sakura (cherry blossoms) in spring, kanten jelly as cool water in summer, chestnuts in autumn and chrysanthemums in winter. Old-style wagashi sales have fallen. Some manufacturers with hundreds of years of lineage have adopted Western ideas such as cheesecake or butter cookies. New confectionary rock stars have emerged. In Kyoto, people queue to buy the famous Cha no Ka. It’s a French-inspired langues-de-chat (cat tongue) biscuit flavoured with okoicha (strong green tea) and a white chocolate centre. I’m a culinary groupie so I queued for 15 minutes and they are worth it! 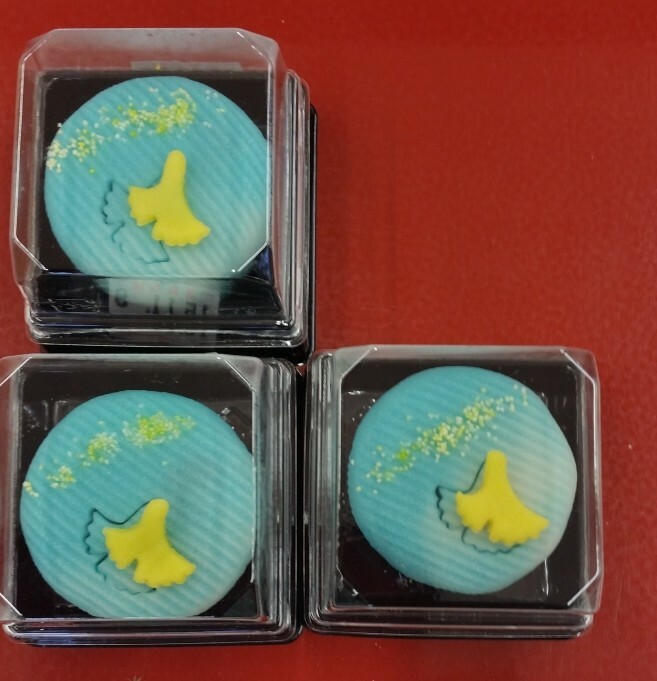 The best places for wide selections of wagashi are department stores, major train stations and airports. 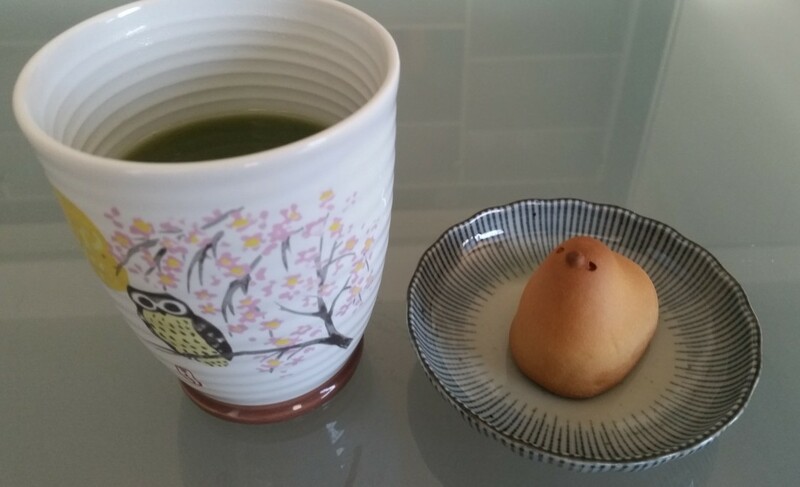 Back in Melbourne, I served Matcha Maiden tea (sourced from Kyoto by an Australian company) with my souvenir Meika chick wagashi. 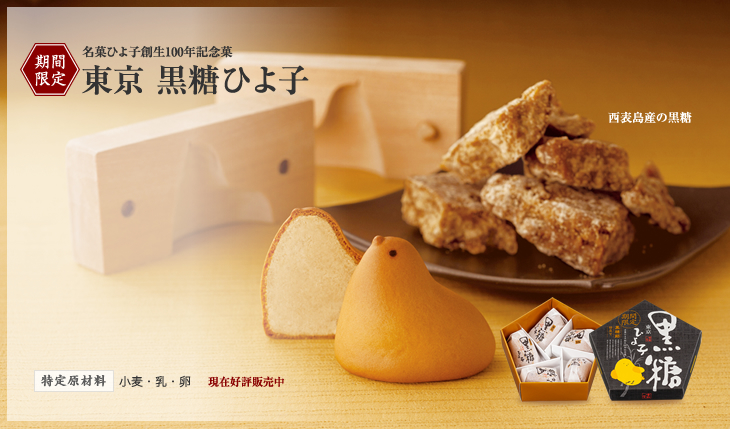 Invented in 1912, these sweets are adorable cakes filled with brown sugar and bean paste. There’s no expertly landscaped greenery to swoon over. Focusing on the matcha, I ignore the sad potted herbs in my peripheral vision. The circular cup is a portal. I sip, warm liquid flows and memories of Japan seep in. It’s a humble attempt to bring the teahouse home. Coffee and tea might have different temperaments but I get why my friend yearned for his bowl of cafe crème. Tea. Such a tiny word loaded with history, customs and connotations. I think Wagashi look really interesting and so unique! I think it’s sad that factories that produced them have now started making western foods. Hi – Yes, they are so beautiful. 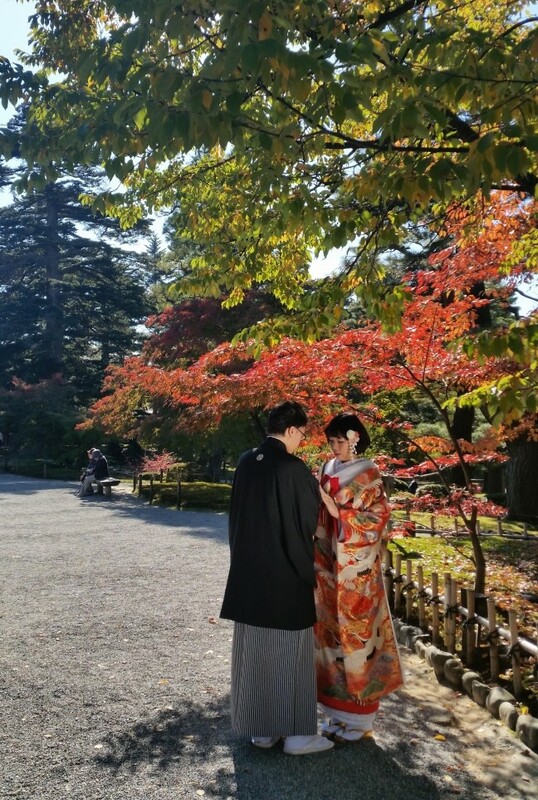 Japan is currently getting record numbers of tourists. 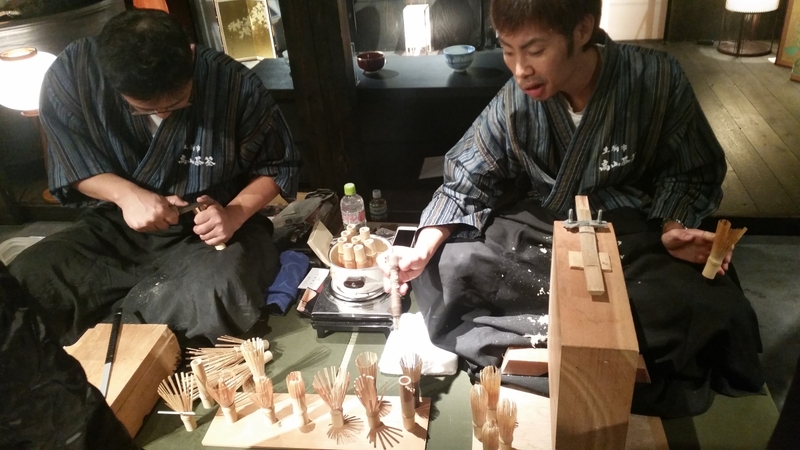 Traditional sweet makers still operate and I hope there will be more interest in keeping the craft alive. Thanks for reading the story!